Lately, many of you have asked us what the rising price of gasoline will do to your sales tax revenue forecast. Using a few data points and simple assumptions, we can calculate the impact of a $1.00 increase in gasoline on our city 1% sales tax revenue on an annual basis (so a $0.50 increase would be half of the impact below) for a city whose population equals 100,000. Since this is a population based estimate, if your population is 10% of 100,000 or 10,000, then the impact would be 10% of the ($449,531) loss or ($44,953). A second possible way of estimating the impact is comparing today’s price to last year’s average. 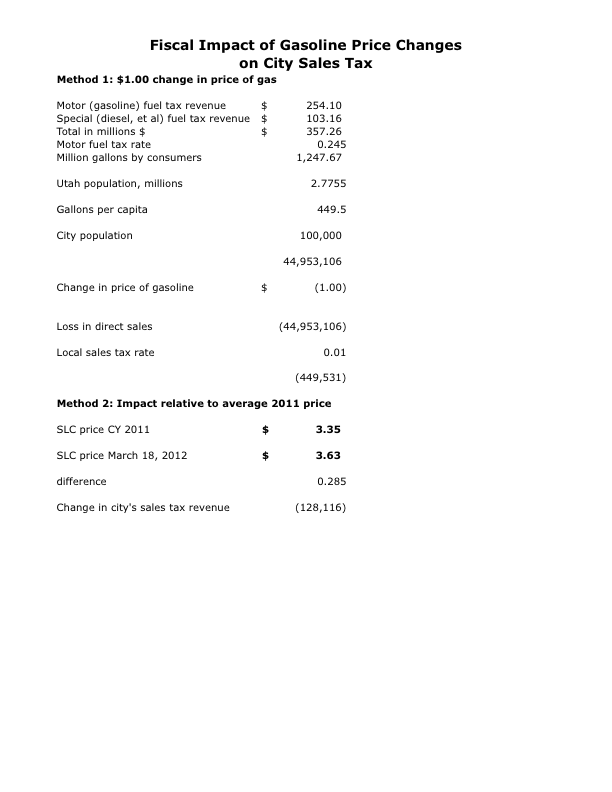 Based on the average Salt Lake City gasoline price for the calendar year 2011 of $3.35, the current gasoline price last week of $3.63 was $0.285 higher so the impact would be ($128,116) loss in revenue if we compare to last year’s average (which swung from a high $3.65 in May to a low of $2.73 in January).